Friday April 16th: I arrived at Udon Thani Airport from Bangkok and was welcomed by Eiw and Alex. I went for dinner at a restaurant alongside Mekong in Nong Khai. Then I went to Jack’s house, got settled in and then went to sleep. Sunday April 18th: I went sightseeing with Eiw and Alex. We visited a big temple where Eiw prayed to Buddha and got a very good fortune from a fortune teller. Then we visited a park with sculptures and scenes of Buddha. Tuesday April 20th: I cycled to Phon Phisai in the morning. I was headed to an internet cafe, but was spotted by Wasana a, Jack’s aunt, Blue and another cousin from their shop in town. They invited me to stay and chat and eat a bit. I cycled back to Jack’s house, where I was picked up by Eiw. 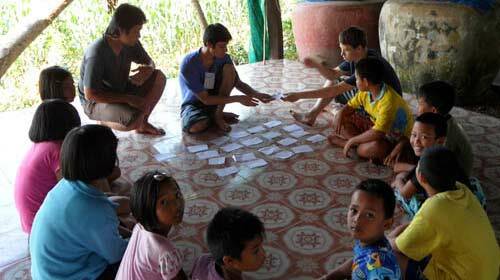 I taught around nine 8-12 year-olds at Eiw’s house in the afternoon, and played Tak Krao(?) and soccer with some guys at a nearby school. Sunday April 25th: At around 5pm some new volunteers arrived! There was a group of 6 girls and 2 guys, from England, France, Germany and Holland. 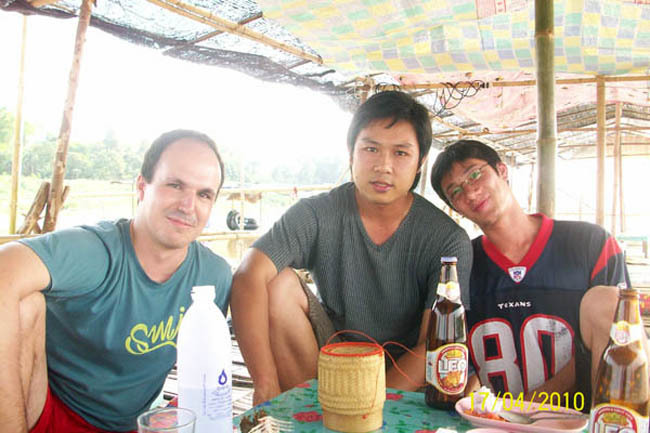 We took a walk to a restaurant overlooking the Mekong and had some drinks. After, we continued our walk, visiting the nearby temple and walking through the fields on the return. Monday April 26th: Today was my first day teaching with Yuphaporn, a teacher at a local high school. After meeting Yuphaporn and her students, I proceeded with class introductions, hobbies and so on. After class, I was taken out to lunch by Yuphaporn and some of her students. In the afternoon, I went to the swimming pool at Santirak with the other volunteers. Friday April 30th: The other volunteers and I went to Pak Suay in the morning. We ate noodle soup for lunch at the shop just outside Santirak. Fridays are sports days for Santirak School, so I watched while the students played musical chairs, and danced. After cookies, fruits and ice creams were handed out to the students, we had a game of soccer between volunteers and students. After the game, and some more ice cream, the volunteers swam in the pool and then we went for dinner and drinks in Phon Phisai. Saturday May 1st: Today we cycled to the Laos market in the morning. After lunch, Jack took us by bicycle to a river in the forest and I practiced driving the motorcycle. 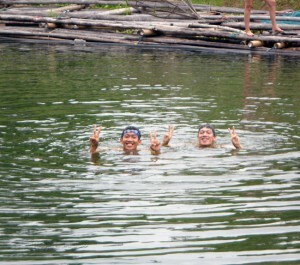 We swam in the river, took photos on Jack’s floating house-boat, and paddled a canoe around. We went for dinner at a western restaurant in Phon Phisai, which was surprisingly quite good, and then went to karaoke. Tuesday May 4th: Today was the day of the Rocket Festival Parade. In the morning we all went to the clothes shop. First we had the makeup done, then the dress. It took a very long time for the shop owners to get everyone all dressed up and ready. 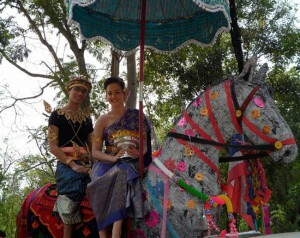 We then proceeded to a village, from where we would start the parade. Katherine and I mounted this fake horse on the back of a truck (since we were the prince and princess). The others walked in procession behind the dancing girls. Tuesday May 11th: Today Toon and I left for Ko Samed! After checking-in at Samed Villa Resort we went for a stroll along the beach. Later that night we went to a nightclub at one of the popular beaches to dance and play pool. Thursday May 13th: We rented a motorcycle today! We rode around the island and went to a cliff top viewpoint overlooking the ocean which was very beautiful. We stopped at a beach and had lunch at a restaurant with tables right at the water’s edge. After a very relaxed afternoon we returned to our resort. Due to current political situation we decided it was not a good idea to return to Bangkok, so we changed our plans to stay for another two nights in Ko Samed. We took the motorcycle and drove north into town for a really nice BBQ seafood dinner. Monday May 17th: Today was the expo for national education in Thailand at Impact Expo Center Mueng Thon. 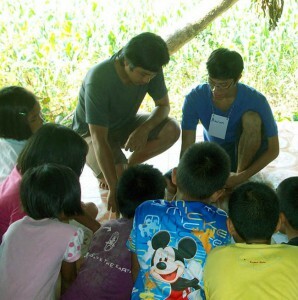 I was to represent the adult education center in Phon Phisai. 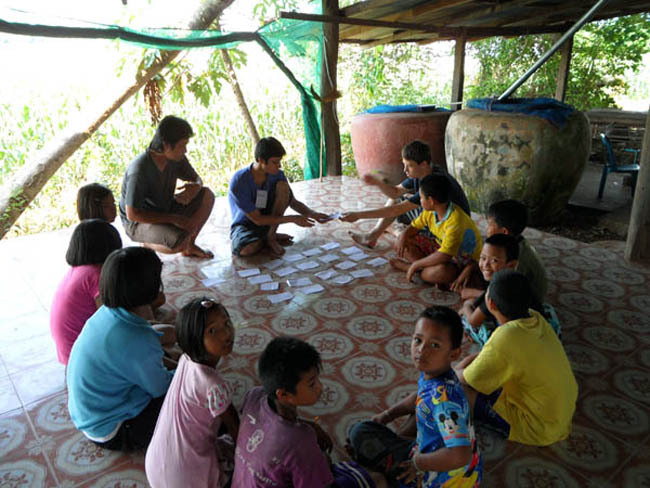 I met up with Jack and a few of the other teachers from Phon Phisai and we demonstrated teaching English for part of the day. I also met and shook hands with the Thai Minister for Education. Wednesday May 19th:In the morning I was taken to Chumpol Phon Phisai high school where I would spend the remaining of my weeks volunteering. I would be teaching under Krue Yuphaporn (who I had met once before), who taught around 6 different classes in M4 (the 10th grade) including one “gifted and talented” class. After being introduced to and assistant teaching three classes, I returned home. In the evening we went to the market in town to buy some cockles, rambutans, mangosteens and fried poo at (crab sticks) to bring to the dinner we were invited to by a friend of Jack’s. At the dinner we were served a traditional Isan chicken soup.